I'm looking to retire in a few short years and start the RV travel life. We became hosts to try and pay it forward by planting a few seeds of kindness. We also learn valuable information about RVing from boondockers about things we haven't experienced since we haven't started our RV life yet. In other words we don't want to learn things the hard way if we don't have to. I am a Quality Engineer for an aircraft manufacturer and have a passion for travel, adventure, and woodworking. I am mechanically inclined and enjoy spending time in my workshop. I am an avid outdoorsman who enjoys life. I am married to my college sweetheart, (38 years) and we have two daughters and three grandkids. No pets at this time but we have had our share of cats and dogs over the years. We are in the process of researching RV's to prepare for extended travel after I retire in a few short years. We were tired, skoolie had just got in from work, we talked for 20 minutes 'til everybody had to go separate ways. We went to eat at a place skoolie told us about, worked out great. Came back and had a peaceful nights' rest. A little embarrassed that skoolie beat us out the next morning ! Thanks for the boondock and we hope to see you here (or there) again ! Stayed here to explore Savannah and it was great. Got there and a fellow boondocker needed a ride to airport next day, so as we were heading in that direction we agreed to bring him and a new friend was made! Host and I had quite a bit of similar interests and had great conversations. Will be stopping by next time we are int he area for sure. We really enjoyed our time Under the Georgia Oaks. Robert and Denise were so accommodating and friendly. It was so much fun getting to know them, and their community. We enjoyed learning about wood working, their RV plans, and going to church with them. We hope to run into them again in the future, especially if it's in Panama. Robert’s place is perfect for boondocking. We parked under towering oak trees in a semi rural setting. Close to Savannah and Hilton Head. We used the WiFi and were able to run our generator when our solar was not enough. Thanks much for providing this opportunity Robert! skoolie2018 was the perfect host. When our original plans fell through, he responded to my last minute request promptly and accepted us. The drive to the property off the interstate was a breeze with our 44' Class A and toad. When we arrived he was there to meet us and show us the best place to park and to make sure there would be room for the other two guests coming later that day. There was plenty of room for everyone. The property is gorgeous with lots of shade trees. Highly recommend this location and we hope to be able to return again sometime. Lovely location, friendly host, all we could hope for. 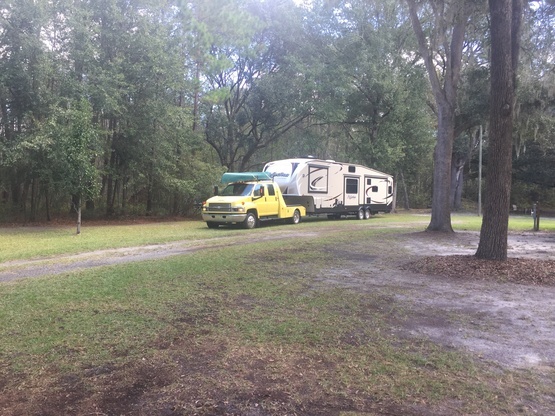 We had the most wonderful time staying with Robert & Denise at their boondocking spot - met some amazing other Boondockers, had water and power, our dogs had space to run and play and it was a quiet, green location. Robert & Denise sure know how to extend that Southern hospitality. They were kind and friendly and we had a great time getting to know them. Felt like staying with family! We highly recommend staying there, if for no other reason, for the experience of meeting such fantastic hosts! Nice place and great people. They host me for the second time at they're place. Robert helped me to do repairs on my RV roof. I don't have words to express my gratitude to them for everything. All my best wishes always. We had a great time being parked here Robert and his wife are super nice and accommodating. They know alot of great places to go and experiences to have. Plenty of room for all size rigs. Hope to come back again!! We orginally requested to stay with Robert and Denise, for two nights only but extended our visit to a long weekend. Not only that the location is green, quite and convinient, half an hour drive to historic Savannah, but host people were what made our visit exciting. We had the opportunity to meet also Robert's father and hear his life story. Highly recommended. Hope to stay in touch and host them one day in our home country. We loved our stay at Under the Georgia Oaks. We weren't able to visit with the owner due to the fact we were so busy enjoying Savannah and only made it back to rig for late dinner and sleep. Would recommend this out of the way location because while it's quiet and rural it was a 30 minute straight shot into Savannah with light traffic. Thanks so much for the hospitality! This is a popular place! By the time we left there were five RV's. There was plenty of room for everyone on this beautiful property, and we had a great time meeting everyone and chatting, especially the family from Montana. The drive into Savannah wasn't too bad. Overall, this is a fantastic place to stay. Robert and Denise could not have been nicer or more accommodating. They are such great people! I only wish we would have had more time to sit around the fire and talk. Robert and Denise really go out of their way for their boondockers! We had wifi, trash and recycling, good water and electricity and a community fire pit available to us. Easy in and out with the circle drive around their home. Peaceful and quiet location and very convent to Savannah. Thank you so much for your hospitality, Robert and Denise! Robert met us at his place and helped set us up overlooking the bush. He gave us fuel to combat the noseeums and a great little table to wind down around. We were able to explore all around the area with ease and he was more than accommodating when plans changed . Thank you so much for everything you really helped us out. We have had only good experiences with Boondockers Welcome and Robert & Denise were even more exceptional than most! They were friendly, accommodating, informative, inclusive, and allowed us to extend our stay a bit to wait for better weather. We had a wonderful experience "Under the Georgia Oaks" and highly recommend to anyone wanting to stay in the Savannah area! True southern hospitality! What a welcoming couple that made us feel like we were family. Robert took time to blow off all of the leaves and even took down a couple of branches that he didn't want falling on us. Wish we could have visited a little more with them, maybe next time! A great stop over that's close to Savannah. Friendly welcome. Shady, level spot, easy in, easy out. Checked out Savannah - amazingly nice- historic district is a real treat, beautiful houses, loads of museums, fantastic food. Warmer than Maine, no snow! Robert was so accomadating and made our stay grand. Hopefully we’ll meet again. Love that Southern hospitality. Robert thanks for letting us stay! Wish we could have stayed longer. Robert is/was a great host even though he was not feeling well! A very nice place and nicer people! We had a great time while staying with skoolie2018. We stayed three nights but didn't get a chance to meet Robert until our last night. He was super friendly and welcoming. We enjoyed getting to know him. Downtown Savannah was an easy 30 minute drive from their location. Thanks again Robert! Robert was very helpful and accomadating. We enjoyed talking about his woodworking. Close to Savannah. Nice quiet spot easy to find. Generous host. We appreciated à lot. Tank you. The location is good, within short travel distance to downtown Savannah. Robert is very friendly and open to sharing experiences and information. He made our stat very comfortable. It was a Great stop.on our voyage south, we will be sure to stop on our way back north and get some guitar playing in. Thanks again. Denise and Robert were the best hosts ever, I wish I’d like to count them as new very good friends. I spent a week, the place is very nice Robert was very helpful since my arrival, he does excellent wood work especially lighthouses, you have to check those! He made a spice ruck for me, that was very nice. Denise cooked an excellent chilly the last night and they invited me over. I hope I will see them in the near future and cook something for them next time and play guitar together again. I left this morning with the feeling of having 2 new very good friends. The place is very nice and both very good hosts. Robert was extremely helpful from the very beginning. Check his wood work especially the light houses, very good work! Beautiful location, with lots of room for our 41 foot Fifth wheel. Great host. Loved the trees and county feeling. Great place to relax and only 30 mins to Savannah, Georgia. Far and above host site ! What an interesting guy. He has so many interests. We had some great conversation, worked together on a project and even jammed for a while. Nice spacious area to park and so close to savannah, perhaps the most beautiful town I've been to. Great host and plenty of space, really quiet area !!! The site is really wide and located in a quiet area. We have unfortunately missed our host but we get all the answers to our questions by email. Would recommend it with no hesitation. Thanks a lot for being our hosts ! skookie2018 are very welcoming. He's a truly gifted woodworker and clearly has a generous heart. The property was rural and quiet which was a welcome change from our typical Cracker Barrel/Truck Stop excursions. Would absolutely stay again. Skoolie2018 were very welcoming. They were sure to suggest an area on their property to give us privacy and our own space, as well as encouraging us to “setup camp” for our stay. They were helpful in recommending events and places to go in Savannah. Location was perfect - thirty minutes easy ride to Savannah and less than an hour to Tybee Island. Their property was in a quiet and peaceful setting. We absolutely recommend a stay with them! Had a great stay with Robert and Denise. Super property for boondockers and an easy drive to Savannah, Hilton Head and Parris Island. If you are a woodworker you will appreciate his shop and talent. Getting ready to purchase their retirement RV. This host was great. When we arrived, we were immediately adviced that we could place our Van anywhere we wanted. As soon as he arrived home he arranged a clean table for us, made a big fire pit and started the fire. Than told us to get as much wood as we wanted. We slept very well for 2 nights and when we left he showed more of his property and told us some nice stories and future plans for his acreage. We sure will come back again if we are nearby.